For use on 1973 – 1978 Trans Am models this is a PAIR of sail panel decals available in 6 factory colors. Don’t settle for cheap ebay knock off decals. 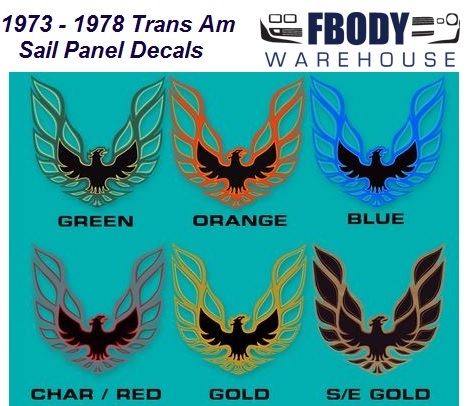 Buy your decals from Fbodywarehouse and produced by Phoenix Graphix and know you are buying the highest quality decals on your car that will last for decades! Sold as a pair, use the drop down menu box to select from the following colors.